The optional full-speed automatic emergency braking bundled in the CX-5’s i-Activesense package is worth the money. The 2018 Mazda CX-5 compact crossover nails the details. Its handling has been expertly tuned, its engine is tuned for efficiency and fun, and its subtle exterior style is understated and elegant. The bad news? The big stuff feels left out. Its space is a little cramped and infotainment just isn't up to snuff. The Mazda CX-5 is available in Sport, Touring, and Grand Touring trim levels, all of which add a few goodies as standard for 2018. Under their hoods sits a 187-horsepower, 2.5-liter inline-4 that can run on half of its cylinders in certain light-load situations for 2018 to reduce fuel consumption. Front-wheel drive is standard, but all-wheel-drive CX-5s are more balanced with less wag of the steering wheel under hard acceleration. The CX-5’s engine is buzzy but responsive and the standard 6-speed automatic gets the job done well. More impressive is the crossover’s steering—nicely weighted and full of feedback. CX-5s with larger wheels ride stiffly and let in too much wind and road noise, a tradeoff for this crossover’s entertaining feel in the twisties. The CX-5’s interior is classy—more so for 2018 with a leather-wrapped steering wheel now standard on all trim levels. Materials are upmarket, especially in high-spec Grand Tourings with their soft leather upholstery and optional luxury features like a head-up display system and a heated steering wheel. 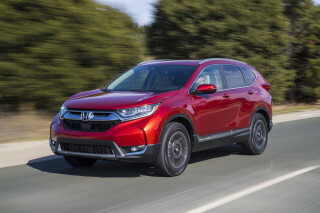 Rear-seat riders aren’t treated to a huge amount of legroom compared to rivals that feel a size larger, like the Honda CR-V and Subaru Forester. The same holds true for thethe cargo area—perhaps this Miata of crossovers idea has been taken too far in some ways. The CX-5 scores well for safety with top-notch results and standard low-speed automatic emergency braking on all trim levels. By compact crossover standards, the 2018 Mazda CX-5 is a knockout. The 2018 CX-5 stands out among its competitive set with its detailing. Its shield-shape grille cants gently forward and features a delicate ring of chromed plastic that dives into the narrow headlights. From the side, the CX-5’s windshield is parked further back into the hood than is typical for a crossover, which almost gives it the profile of a rear-wheel-drive crossover. A simple rear bumper and smaller taillights than most crossovers adds to the stylized look of the CX-5. When swathed in one of the three extra-cost shades—red, gray, and pearl white—the CX-5 is particularly good looking. 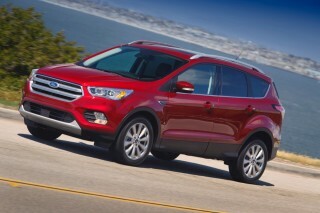 But even the base model with its 17-inch alloy wheels and LED headlights looks the part. Inside, the CX-5’s dashboard is busy without being overwhelming. It borrows heavily from its CX-9 big brother with a pleasantly cohesive look with a high center console and a vertically arrayed dashboard. The standard touchscreen infotainment system plunked on the top of the dash looks good but presents some ergonomic quibbles that we’ll address in the comfort section of this review. 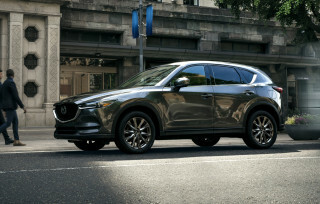 The CX-5 line comes with just one engine, a 2.5-liter inline-4 rated at 187 horsepower and 185 pound-feet of torque that’s paired exclusively to a 6-speed automatic transmission. 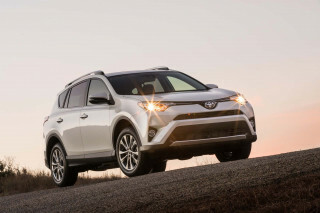 Front-wheel drive is standard and all-wheel drive an option across the lineup. This year, the CX-5’s engine gains active cylinder displacement, which allows it to run on half of its cylinders to save fuel during light load situations like cruising or coasting. We'd love to tell you what the cylinder deactivation system feels like, but after 150 miles behind the wheel, we can confirm that Mazda's claim about the system's transparency is spot on—we couldn't pick out when the 2.5-liter engine was running on two cylinders or four. And unlike certain GM products with V-8 engines, there's no tell-tale icon in the instrument cluster that flips on when half the cylinders are deactivated. Instead, the new engine behaves just like the old one—it's quick off the line, with strong mid-range punch, a quiet cruising character, a linear throttle. It still doesn't sound great, particularly under hard throttle, with thrashiness becoming an issue at high engine speeds. But the engine's power is scarcely any different than last year. The impact of active cylinder displacement on fuel economy is more difficult to judge. During our time with the CX-5, we saw vehicle-indicated fuel economy in the mid 27-mpg range during a highway-heavy mix. That's better than the CX-5's EPA-estimated combined fuel economy of 26 mpg, but it's a good ways away from its 30-mpg highway rating. We'd expect, though, that over a longer highway stretch the overall fuel economy would creep closer to the EPA's highway estimate. The 6-speed automatic delays the 1-2 shift to allow for more brisk acceleration than the relatively modest engine output might suggest. This is one of the largest engines in its class, but the lack of a turbocharger means it provides merely adequate acceleration. Under the CX-5 sits independent struts up front and a multi-link setup out back that soaks up road imperfections well. Most of our driving has been in Grand Touring trim level CX-5s with their 19-inch alloy wheels, but a brief drive in a Sport with the standard 17s revealed only a slightly softer ride. Try each flavor first. Chief among the CX-5’s attributes is its electric power steering system. Not only is it nicely weighted, it holds a line exceptionally well. That’s something few automakers have figured out and it contributes as much to the CX-5’s entertaining feel on the road as it does to reducing driver fatigue on any kind of terrain. There’s also engine torque vectoring that helps reduce head toss by dialing back the amount of steering corrections drivers have to make while entering and exiting corners. The system additionally works to keep the CX-5 in a straight line on the highway. The CX-5’s all-wheel-drive system is among the segment’s more sophisticated in that it uses various sensors to predict weather conditions, including whether the windshield wipers are activated. Although not intended for serious off-road use, the all-wheel-drive system works as advertised to make the CX-5 exceptionally sure-footed in deep snow. The 2018 Mazda CX-5 boasts a high-end feel inside and can be loaded up with nice options, but its cargo area is cramped. The driver-centric cockpit has good visibility out and thin roof pillars. A high center console means that small item storage is weak and it also forces the infotainment control knob to be awkwardly located. On the other hand, the CX-5’s standard cloth upholstery has a durable feel, while the synthetic leather on Tourings looks a little chintzy to our eyes. Build your CX-5 up to Grand Touring level with its soft real leather and you’re almost at BMW-levels of luxury for a fraction the price. The CX-5’s front seats are comfortable and supportive; power adjustment is standard for the driver on Touring and Grand Touring. The CX-5’s rear seat is acceptable, but only just. Against some competitors with stretch-out room in the back, the CX-5 can feel cramped for three. Where the CX-5 really shows its compact dimensions is in its cargo area. With the second row upright, there’s about 31 cubic feet of luggage room. Fold the second row flat and that figure rises to just shy of 60 cubes, which comes up about 10 to 15 percent less than some key rivals. The CX-5 is loaded up with sound deadening materials, but its engine occasionally lets in too much idle rumble. The 2018 Mazda CX-5 rates well for its safety features, but federal testers have bad news. The 2018 CX-5 Sport comes standard with low-speed automatic emergency braking, blind-spot monitors, and rear cross-traffic alerts. 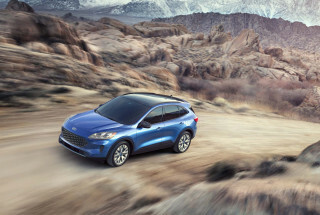 Standard on the Touring and Grand Touring (and optional as part of the i-Activesense package on Sports) is full-speed automatic emergency braking, automatic high-beam headlights, active lane control, adaptive cruise control, and lane-departure warnings. The IIHS calls the CX-5 a Top Safety Pick thanks to top "Good" scores on all its crash tests. Only the LED automatic high-beam headlights on CX-5 Sports with the i-Activesense (Mazda-speak for safety gear) package and all Touring and Grand Tourings earn an “Acceptable” rating from the agency for their effectiveness, however. The standard LED headlights without automatic high-beam technology earn a “Marginal” score. The federal government rates the CX-5 at four out of five stars overall, despite five-star scores for its frontal and side-impact crashworthiness. The CX-5 earns four stars for rollover, something typical for high-riding crossovers. 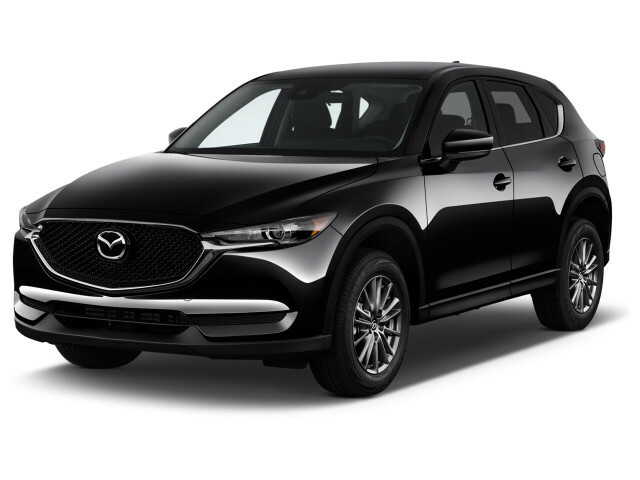 The 2018 Mazda CX-5 is exceptionally well-equipped for its price point at every level and a loaded model gives luxury crossovers a run for their money. However, we’ve dialed back a point for this crossover’s cumbersome, limited-feature infotainment system. The 2018 CX-5 is available in three trim levels: Sport, Touring, and Grand Touring, each of which is available with all-wheel drive for $1,300 extra. 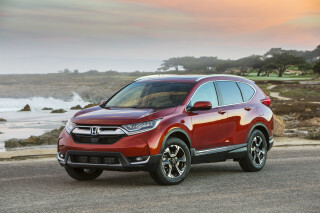 Every trim level has a single option package that adds a few more features. At a little over $26,000, the Sport comes with a leather-wrapped steering wheel and gear knob, 17-inch alloy wheels, LED headlights, cloth upholstery, power windows and locks, a 7.0-inch touchscreen for infotainment, blind-spot monitors, low-speed automatic emergency braking, and rear cross-traffic alerts. 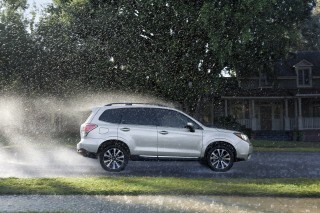 For $625, a worthwhile i-Activesense package adds full-speed automatic emergency braking, adaptive cruise control, active lane control, automatic headlights, and rain-sensing windshield wipers. The CX-5 Touring stickers for about $27,200 and builds on the Sport i-Activesense package with 19-inch alloy wheels, leatherette upholstery, a power driver’s seat, keyless ignition, heated front seats, dual-zone automatic climate control, rear-seat vents, and additional USB ports. An optional Touring Preferred package adds Bose audio, an auto-dimming rearview mirror, a power moonroof, a power liftgate, and navigation for a very reasonable $1,200. Topping the lineup, the CX-5 Grand Touring builds on a loaded Touring with leather upholstery, memory for the driver’s seat, a power passenger seat. The $1,395 Grand Touring Premium Package adds a head-up display, a heated steering wheel, and heated rear seats. All-in, a loaded up CX-5 runs less than $34,000. Despite the high level of equipment, the one thing that continues to let the CX-5 down is its infotainment system. The menu-intensive software is challenging to use at a quick glance and it lacks Apple CarPlay and Android Auto. Overall, the CX-5 rates a 7 out of 10 on our scale. With standard front-wheel drive, the CX-5 scores 25 mpg city, 31 highway, 28 combined according to the EPA. 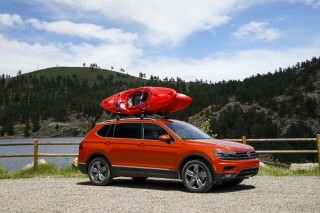 Add all-wheel drive and those figures drop to 24/30/26 mpg. Cylinder deactivation means that the CX-5 can run on just two of its four cylinders during low-load cruising situations, which should mean reduced real-world fuel consumption compared to last year’s CX-5. 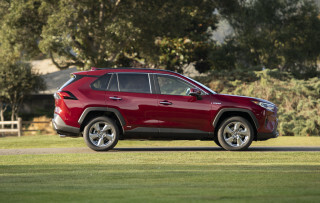 And that’s important since the CX-5 isn’t among the highest-rated crossovers for its fuel efficiency. 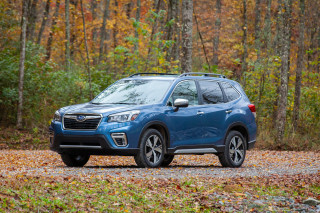 For instance, the roomier Subaru Forester is rated at 28 mpg combined with standard all-wheel drive and the turbocharged Honda CR-V nets 30 mpg combined with front-wheel drive.